Saratoga Springs has the only naturally carbonated mineral springs east of the Rockies, with concentrations of 16 substances including bicarbonate, chloride, sodium, calcium, potassium, and magnesium. The city was one of the great spa cities of the 19th century, a place where the wealthy gathered in the summer season to relax, attend horse races, stroll in the gardens, take the waters and generally see and be seen. Known as the "Queen of Spas" in America, Saratoga Springs was very much in the tradition of the 19th-century European spa towns like Baden-Baden, Germany. Many great American spa cities slipped into dowdiness and worse after "the spa cure" was replaced by modern medicine. In recent years, the pendulum has swung back toward more natural treatments like mineral baths, and Saratoga Springs is one of the few places in America where you can enjoy something approximating the 19th century spa experience—bathing in and drinking the waters, betting on the thoroughbreds, dining out, strolling through the park or the shops of the historic downtown, and enjoying the ballet and orchestra in the summer. If you're a spa lover, the best place to stay is The Gideon Putnam. This fine hotel is located right inside the 2,200-acre Saratoga Spa State Park which was established in 1915 to protect the springs. The Gideon Putnam is right across from the Roosevelt Baths & Spa, a beautiful 1935 brick and limestone neoclassical building where you can enjoy mineral baths in the original tubs and get an expert massage afterward. The Roosevelt Baths spa menu has been greatly expanded in recent years to include spa basics like baths, massages and facials, and body treatments, as well as more esoteric offerings like Ayurveda and Bach Flower Remedy consultations, meditation instruction, energy work, and personal coaching. The Saratoga Spa State Park is also home to the nationally-known Saratoga Performing Arts Center, the summer home of the New York City Ballet and the Philadelphia Orchestra. It is just a few minutes walk from the Gideon Putnam—a huge advantage if you're attending a concert, as the traffic can be challenging. Other attractions within the park's boundaries include the Spa Little Theater, the National Museum of Dance, and the Saratoga Automobile Museum. The Gideon Putnam also offers yoga and exercise classes on Tuesday through Friday. You have easy access to the daily tours and educational programs offered within the park, such as guided walking tours of the springs. You can also learn about the park's architecture, bluebirds, butterflies, and trees. In this way, a stay at The Gideon Putnam has become more like a classic destination spa. On certain weekends, The Gideon Putnam and Roosevelt Baths offer "Spa Renewal Wellness Retreats” that include lodging, one bath per day, most meals, and a cooking class, along with activities and workshops. Check the Gideon Putnam website for the most up-to-date information. The waters were sacred to the Mohawks, who call the area Serachtague, “place of swift water." A mispronunciation of this name is how the area became known as Saratoga. The tribe believed the naturally carbonated water had been stirred by the god Manitou, endowing it with healing properties. The springs were "discovered" by Sir William Johnson in 1771 and soon became an attraction for European settlers, who shared the Mohawk belief that mineral waters have healing properties. When Gideon Putnam settled near High Rock Spring in 1795, he saw the area's potential and purchased land near Congress Spring and in 1802, opened Putnam's Tavern and Boarding House. It was a success, and more inns followed. In 1831, with the advent of the railroad from New York City, tourism took off. ‘Taking the cure’ at Saratoga was a firmly established tradition for thousands of visitors. Horse racing has been part of the Saratoga Springs scene since 1847 when a meet for trotters was held on a dirt track adjacent to Union Avenue. In 1864 a larger track was built on the opposite side of Union Avenue, the site of the current Saratoga Race Course. John Morrissey’s Club House, the current Canfield Casino and museum in Congress Park, opened in 1870. Following an afternoon at the race track, millionaires often gathered to gamble for high stakes, surrounded by high Victorian elegance. Diamond Jim Brady, Lillian Russell, Lily Langtry, and Bet-A-Million Gates were among those who added glamour to the Saratoga scene. Ornate Victorian mansions were built by the rich on North Broadway and around town from the 1870s to the turn of the twentieth century. Dubbed summer “cottages” by their wealthy owners, they hosted visiting Presidents, ex-Presidents, politicians, and business magnates. Other notables, including Susan B. Anthony, Sarah Bernhardt, Caruso, Victor Herbert, John Philip Sousa, Daniel Webster, and Oscar Wilde also visited. Companies had been developing the area, building plants atop the springs and use powerful steam-powered pumps to extract mineral water for its gas, which was then sold to beverage companies. In 1909, the state of New York began buying up land to preserve the mineral waters, which were being depleted by the commercial development. This preserve eventually became the Saratoga Spa State Park. Governor Franklin Roosevelt frequented Saratoga Springs' bathhouses while battling polio and, in 1929, he appointed a commission to develop a health treatment facility there. With that decision, construction of Saratoga’s spa began. In the 1930s, the state funded the project to build the Saratoga Spa State Park, including The Gideon Putnam and four gorgeous neo-classical bathhouses right inside the park. Of the four original bathhouses, only the Roosevelt Bathhouse is still open for baths. It was renovated and reopened in 2004. The others have been converted to other uses. 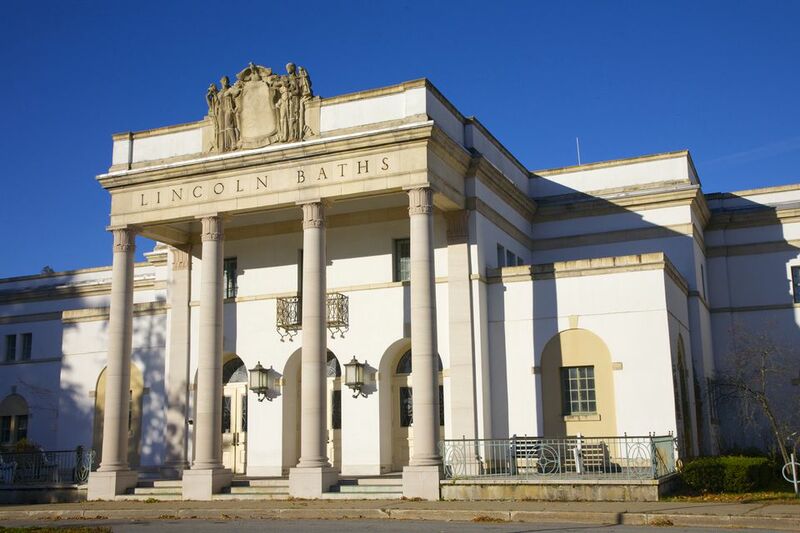 The Lincoln Baths were transformed into office space, but you can still go on certain Saturdays to a farmer's market and check out the historic architecture. In the 1940’s, a three-week stay was considered the norm and included 21 mineral baths, accessory treatments, regulated diet, rest, exercise and recreation. The number of baths peaked in 1946 at 200,000 baths a year, whereas there were around 25,000 baths given at the Roosevelt Bathhouse in 2015. There is an important difference in the Saratoga Springs spa experience of today compared to that of yesteryear: Originally the state owned equipment that heated the naturally-carbonated mineral water, which comes out of the ground cold, to the correct temperature. But when that equipment broke, it was deemed too expensive to replace. The easier, cheaper solution was to heat tap water to an extremely high temperature and combine it with the pure mineral water. As a result, the unique experience of bathing in naturally bubbly spring water is lost. It is possible to still get the unadulterated mineral bath, but these services are booked well in advance by the cognoscenti. On the positive side, the bathhouse is beautiful, the massages are top-notch, and they have added extras like Judith Jackson aromatherapy. The Peerless Pool Complex consists of a main pool with a zero-depth entry, separate slide pool with a 19' double slide, and a children's wading pool with a mushroom fountain. The slide pool has a minimum height requirement of 48" tall. The Historic Victoria Pool is a smaller pool surrounded by arched promenades. Both pool areas include food and beverage services, showers, locker rooms and restrooms. The Saratoga Spa State Park offers two beautiful golf courses; a championship 18-hole course and a challenging 9-hole course, complete with pro shop and restaurant. The gentle terrain offers picnic areas, shady streamside trails, suitable for the nature-lover or the casual walker, as well as certified running courses used by joggers and high school and college athletes. Winter activities include cross-country skiing on approximately 12 miles of trails, ice skating, and ice hockey.